Congratulations! You made it to the interview stage of the application process for occupational therapy school! If you haven't yet, and you're just getting ideas, check out how to best boost your OT school application! That is a real accomplishment, and you’re almost at the end! You're beginning to see the light at the end of the tunnel. Then your nerves and excitement kick in. You’ve most likely been to in-person interviews, but have you ever been met with the challenge of recording yourself for an interview? I’m not talking about Skype or Zoom. I’m talking about recording yourself answering interview questions and uploading it to YouTube. As more and more OT programs are seeing an annual rise in the number of applicants, video interviews might be the interview of the future. Even if this isn’t the case, many programs are using this method in order to view their applicants in a timely manner. If you’re like me and are not one to create vlogs or videos, then this can be somewhat of a daunting task. Questions begin to flood your mind not only about how you will answer the questions, but how you will record the interview. Don’t stress too much. Below are some quick tips on how to slay your video interview with confidence! The following information is geared toward video interviews, but portions can be a supplemental resource for in-person interviews! Following instructions is probably one of the biggest aspects that will be consistently addressed in your grad school program when it comes to assignments. Following instructions correctly is significant for both grant and research proposals as an OT. Therefore, begin practicing now! Be sure to read and fully understand what the guidelines are for your video interview. You will receive these with your invitation. If you have any questions, don’t hesitate to contact admissions and clarify those prior to preparing your video. This one is important. You will be given the exact questions that you are required to answer within a time limit. Additionally, keep in mind that eye contact to engage the interviewer is still a significant factor! I recommend formulating answers to these questions beforehand with adequate time to practice and make adjustments. Begin by researching and compiling a list of general frequently asked questions (FAQs) and formulate potential answers for each. You can find our list of 7 questions you can expect here! If possible, do not memorize answers word for word. This way you won’t sound too calculated (showcase personality, naturality, and of course your adaptability). However, practicing is definitely recommended. I’m sure you’ve all heard the saying “practice makes perfect” at least once in your life. This situation is no different. Preparation and practice definitely help, especially since you will be responding to questions while looking into a camera. You will feel more comfortable going into an interview with some sort of plan of action. This comfort will definitely show when you begin responding to the questions! If you need additional help and are still in undergrad while applying, I recommend reaching out to your career center. You have the opportunity to set up mock interviews, receive guidance from professionals, and review your answers to those FAQs. If you are applying to programs post-undergrad or don’t have access to career services, reach out to your friends, family, OT practitioners that you observed, etc. Once you find someone to help you, ask them to run mock interviews with different questions so that you have the opportunity to answer spontaneously from your repertoire of life experiences. Make it personal with specific facts/details. For example, maybe you like to ride your bike in your spare time. Don’t just leave it as that. Develop your answer with specific facts. When describing your love of riding bikes instead try: “When I have the opportunity to take a break from working or studying I enjoy mountain biking in Big Bear, CA. I ride uphill for the exercise, but I enjoy biking downhill more because of the adrenaline rush of jumping over rocks and tree roots.” Many people like to bike, but where do you like to bike or why do you like to bike? Add in the details! At this point, you are one step further on your path to becoming an OTR/L. Hence, treat yourself like the future OTR/L that you are. Here’s where the confidence aspect comes through. Keep this in the back of your mind when you are answering the questions. Relate your experiences and qualities back to what you believe it means to be an OT. Some qualities, according to Top Occupational Therapy include creativeness, problem solving abilities, patience, and compassion. If you've at all considered a specialty, this can be a great time to mention it! Check out this guide on finding your niche as a new grad OT. If you need to, take a look at the Core values and Code of Ethics for OT. Imagine how you have practiced some of these values in your previous job experience, relationships, sports affiliations, etc. and how impressive it would be for you to implement these into the profession! You’ve prepared your responses, but where and how should you prepare your environment? Do not, I repeat, do not record with the sun or light source from behind you. Record at a time of day when natural lighting is sufficient, and make sure lighting is sourced in front of you. Don’t feel restricted to staying within the norm. If you want a traditional vibe, then shoot with a plain background like a wall. But, if you love the outdoors and that’s an integral part of who you are, then shoot outside in your garden or aesthetic outdoor space. This will definitely showcase your unique personality! Absolutely make sure you leave enough time for you to record, edit, and submit your video interview! I recommend recording your interview at least a week before the deadline. You may begin to record your interview and find out that you need more retakes than you initially anticipated. In fact, it took me 5 hours to get a complete take that I was satisfied with submitting. Plan accordingly! If you feel awkward speaking into a camera and like you can’t express your body language, I suggest recruiting a friend or family member to stand behind the camera. This way you will not only maintain eye contact with the lens, but your body language and facial expressions will be more evident and natural! Similar to a bio on a social media account, whether it be Linkedin, Instagram, or your NGOT profile, it is important to introduce yourself. Provide a quick blurb including your name and current position, or anything you find interesting and can be used to transition your interview. Expressing your gratitude for this amazing opportunity, that quite frankly doesn’t come by every day, in my opinion, is a must. If you’ve made it to this round, schools have already begun to filter through their applicant pool. You were selected. So be sure to be gracious and courteous. Each and every one of you encompass personal experiences and attributes that contributed to you getting to the interview rounds of the application process. Before this, everything was on paper. The interview is your chance to give a face to your accomplishments and skills. This is huge! Just as with regular old in-person interviews, maintaining eye contact with the camera (and the invisible interviewer behind the camera) is important. My two recommendations for helping maintain eye contact are to have a friend or family member stand behind the camera and/or to position your notes at eye level by the camera. Hand motions, movement, facial expressions. We use these to communicate with people in our everyday lives, and a scheduled interview with professionals with the duty of determining your future in their program (no pressure!) should be no different. It is these cues that we can provide as we are listening and talking that will show your comfortability, disguise your stress, and ultimately connect with the human being that is watching your interview. My tip for naturally encouraging these qualities is to have a friend or family member stand behind the camera so that it is as if you are engaging with them, or if you decide this is too awkward, just be mindful of engaging the interviewer through the camera as if you are sitting in front of them. I remember contemplating over this single issue for a while. “Do I include the question or do I just answer accordingly without stating the question?” In this case, you do you. However, keep in mind that you will most likely have a time limit, so maximize your content! I found it helpful and efficient to transition from each question by simply integrating the question into the first sentence of my next answers. The location or background in front of which you choose to shoot your video is a language all on its own. As mentioned in a previous section, don’t feel restricted to staying within the norm of a traditionally plain background. Showcase your personality and make yourself stand out with a backdrop that is unique to you and your interests. Similar to introductions, video interviews must also transition to a conclusion. Conclusions typically include questions on your part, a handshake, and an expression of appreciation. Therefore, it’s appropriate to conclude your video with a closing statement with the elements below. Again, just like before, end with another gracious thank you. Identify in what ways their program will help you reach your aspirations of being a successful OT. Keep editing to a minimum, if possible. The amount of editing depends on whether or not you recorded the answers seamlessly or if you broke up each answer into a separate clip. Either way, keep edits clean and simple. You want the focus to be on you and not the movement of the screen caused by transitions and more non-organic editing styles. Submit your recorded interview in accordance with the individual program's instructions. Please be sure to follow those to a T! You have put so much hard work into creating this video, it would be a bummer if something went wrong in the end. I recommend reaching out to the university to personally thank them once more, and to double check if your interview video was received and could be properly viewed. As mentioned before, thank the interviewer or review board after introducing yourself and close your interview by thanking the interviewer once more. Send a follow-up email or mail a thank you card within 24 hours after the video interview. Add personal information about how this opportunity or specific program will help you become a step closer to your aspirations to be a successful OT. Express those specific goals you have! 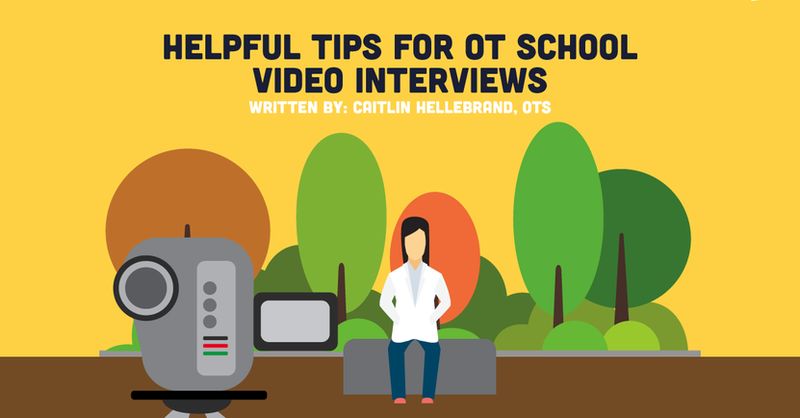 There you have it, a quick composite of some tips that can help you compose and rock your OT admissions video interviews!